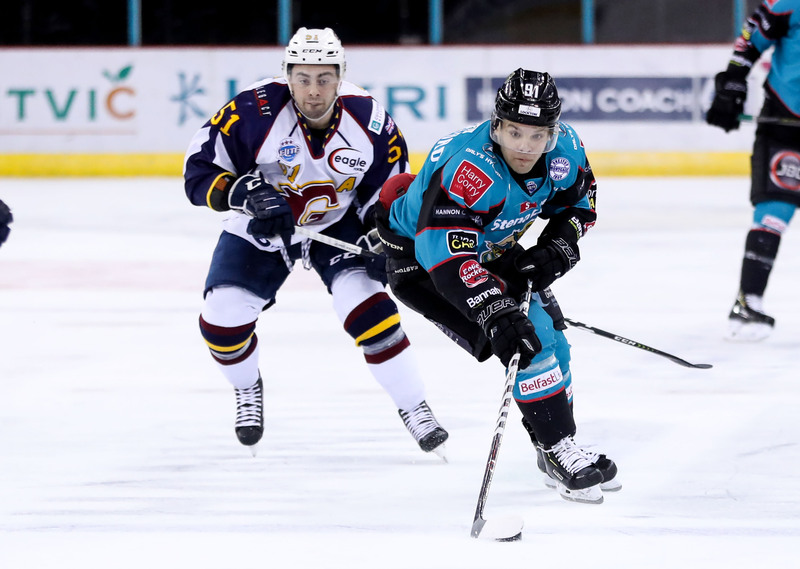 As the Guildford Flames arrived in town for a Fri/Sat Double Header, the points gap at the top of the Elite Ice Hockey League remained at 3 between the leading Cardiff Devils and the trailing Belfast Giants. 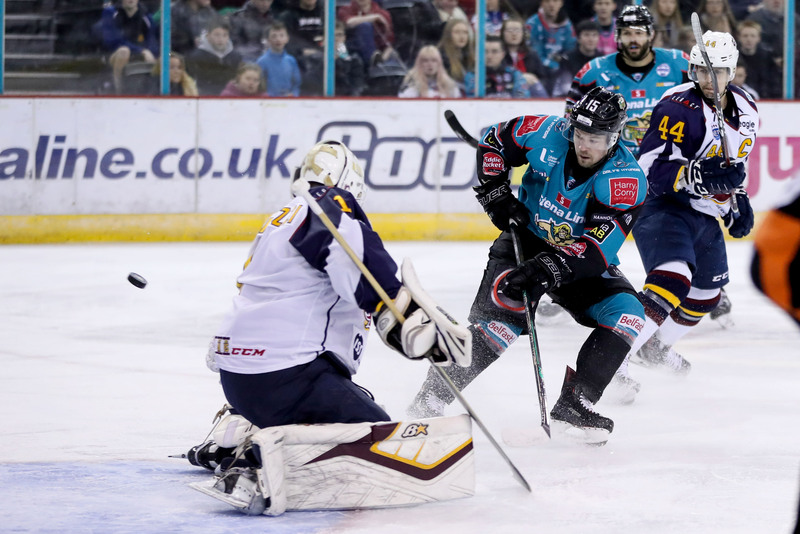 It’s the cut and paste statement at this time of the year, but as the Giants faced another three in three including Sunday’s trip to Nottingham, it’s playoff hockey time. The first to flinch loses the title. 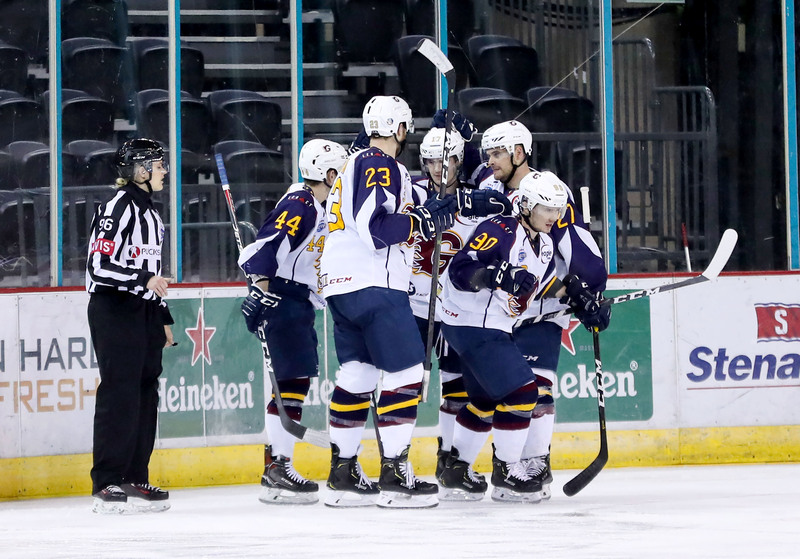 Guildford were without Kevin King, Evan Ritt, Jeremy Lundin and backup goaltender Mike Will for the trip, while Belfast were still missing Patrick Dwyer- in addition to long term layup Guillaume Gelinas- following his knee on knee contact against Coventry last week. 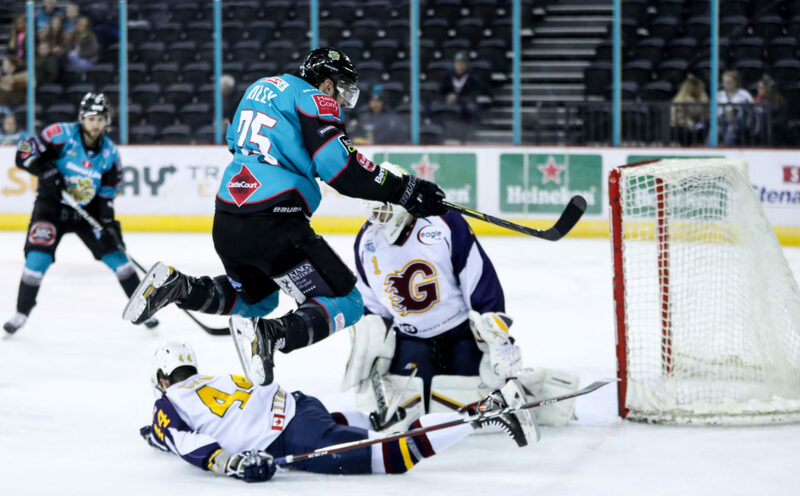 The Giants started the encounter sharp with a couple of stunning early chances on Flames goaltender Chris Carozzi- both David Rutherford and Colin Shields denied from close range following beautiful offensive build up play. The key to beating the Flames this season seems to be ‘stay out of the box’- so it was an early concern when Curtis Leonard took 2 for roughing in the East end at 2.41. Thankfully the Belfast PK unit took care of the danger. The Giants were notably sharper in their own zone in the first ten minutes, compared to last week’s high scoring affairs. With 4.17 left in the period Belfast had their first man advantage as Brett Ferguson sat for slashing, however they failed to throw enough traffic on goal to be effective. With 49 seconds remaining in the first, Calle Ackered took a high sticking penalty and Belfast closed out the period on another power play. It took almost seven minutes of the second period for the Giants to properly threaten in the Guildford zone, employing the screen and crashing down on secondary scoring changes- notably Dustin Johner chasing down a sharp Blair Riley shot- but still to no avail. Belfast went back on the power play at 27.43 as Corbin Baldwin took an interference call, but once again the PP unit struggled. Tyler Beskorowany found himself stranded in his right faceoff circle when a loose puck found a Guildford stick. His own sharp reactions to take away the angle and the diving teal bodies in front of net thankfully took care of the danger. The same Beskorowany made a pair of stunning saves to deny a sustained period of Guildford pressure with 3.26 left in the period. The second period of a tight game ended with SOG all square at 15. Darcy Murphy was denied twice by a red hot Carozzi early in the third, his second effort agonisingly grazing the crossbar. Belfast rallied as the clock hit the 13 minute mark, and the Teal army responded- sensing the sudden urgency to get back into this one. 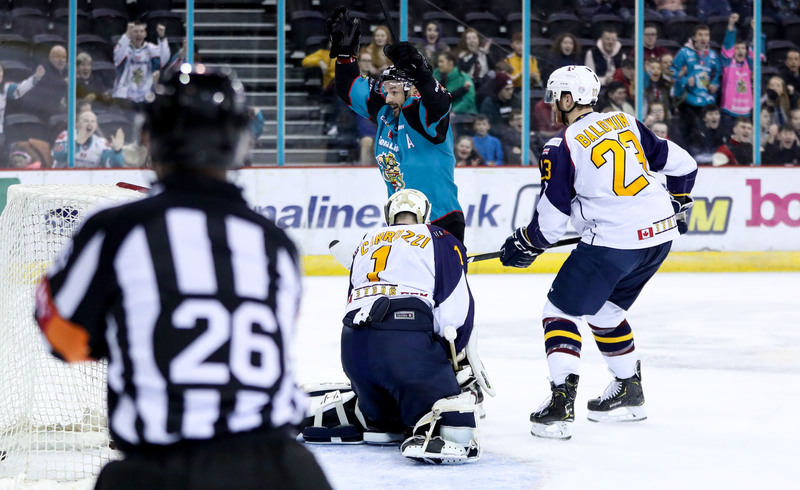 Belfast’s power play were handed an opportunity through a too many men call, served by Ben Davies at 47.18- Adam Keefe promptly called a timeout to draw up the plan. The Giants lifeline came in the shape of a power play with 3.26 left in the game- as Jordan Abt tripped Josh Roach in the Flames zone. The puck fell to Colin Shields in the slot at 57.50, and the Greatest British player of all time made no mistake, wristing an absolute rocket past Carozzi to tie it up at 2-2 to wild scenes in the stands. A point salvaged, and as the game headed to overtime, Guildford were outshooting Belfast 24-27. 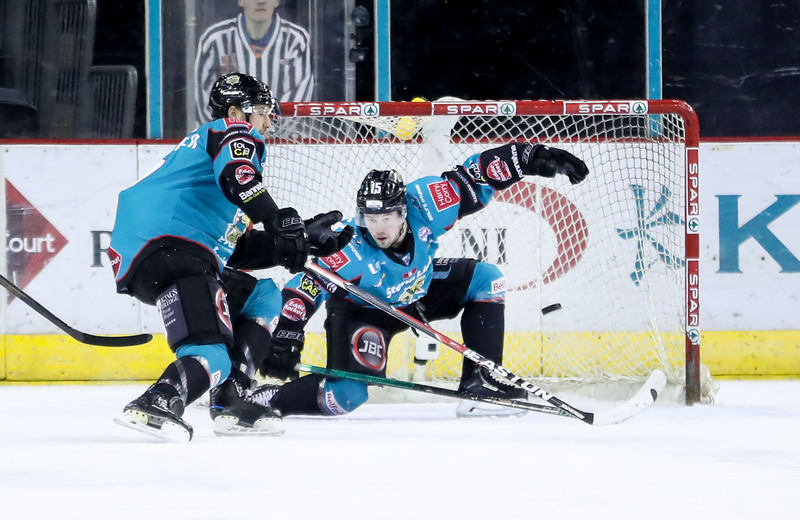 The puck was laid at the feet of Chris Higgins with 3.12 left in 3 on 3 OT, and the Belfast Datsyuk ripped a wrist shot past Carozzi to seal the OT win and 2 vital points in the chase for an EIHL title.